I’m always amazed at what people can do with a bit of yarn and some imagination. I had a lazy Sunday this weekend and spent a good hour or so browsing endlessly from website to website gawping at beautiful couture knits. Some of these are pre-2014, but worth a mention nonetheless. 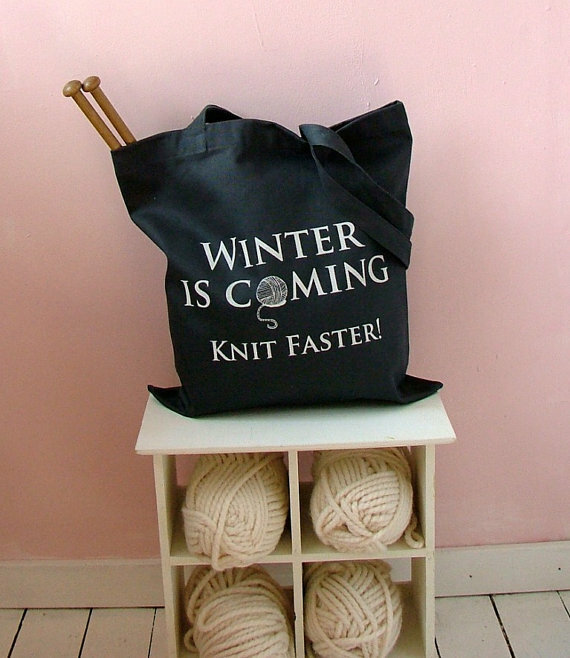 Just take a look at this knitting eye candy. Links to all of the designers shown are included below. I heartily recommend you check them all out – and let me know if you’ve got a favourite knitwear designer! I have to share these lovely purchases that I treated myself to a few weeks ago. I got this tote bag and stunning mug from Kelly Connor Designs on her Etsy shop, where she sells a lovely range of quirky and amusing gifts to satisfy the geeky knitter in me. So here it goes – my first post. Anyone else struggle with writer’s block?! I’ve been busy knitting things for friends and family for the past few months, so I’ve finally decided to knit a few things for myself. The main problem with that is, I have too many things that I want need and now I have about five different projects on the go, all half-started, all stashed in a corner waiting for me to prioritise! It’s been almost eight months since I knitted the beautiful Anais sweater by Brooklyn Tweed for myself and I enjoyed it so much, I resolved to keep one project of my own on the go all the time. It’s never that easy!